Sony launched its Xperia Z5 series at IFA 2015, which was held in Berlin on September2015. The series was liked by many due to its stunning camera perfection, designing aesthetics and overall performance. After this successful launch there has been rumour about the launch of a Premium version of Xperia Z5. The rumour was that Sony will be launching Xperia Z5 Premium in Pink colour. It seems that the rumours are true. Sony launched the new XperiaZ5 Premium in elegant Pink colour through its official Twitter Account. Along with the tweet company also posted the image of the new handset.Murai-san, the designer of Xperia Z5 Premium Pink said that this Pink colour was originally meant for XperiaZ5 Pink. He also concluded that Pink was opted inorder to give the device lighter feel and giving a glossy finish. When we look at the image of new Xperia Z5 Premium, we could understand that the Pink colour has made perfection to its name making it real “Premium”. 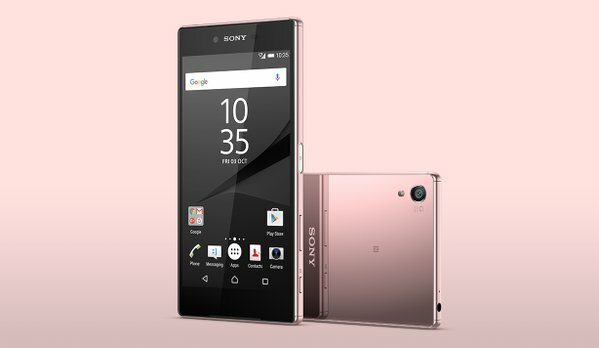 The company officials also made it clear that Pink colour was selected for Xperia Z5 Premium as an inspiration from the Sakura cherry blossom in Japan. Whatever reason, Pink colour definitely gives an elegant and classy look to new Xperia Z5 Premium Pink. Instead of giving a matte finish, the designer opted for Chrome version with a mirror effect on the back panel. This will ultimately let you to see your reflection as if you are looking into a mirror. Well, Xperia Z5 Premium Pink holds the tag of world’s first smartphone launched with 4K display. The display is packed with a 5.5 inched screen supported by Triluminous Display. The screen is having a resolution of 2160*3840 pixels. Other smartphones have the ability to capture 4K videos but Xperia Z5 PremiumPink has the ability to capture as well as play 4K videos, which makes it the world’s first ever smartphone to support 4K display. But this facility is available for in-built apps. It means that 4K facility can be enjoyed when photos and videos are seen through in-built smartphone apps. XPERIA Z5 PremiumPink runs on Octa-Core Qualcomm Snapdragon 810 processor. It is 64-bit powerful processor which is essentially needed by a premium smartphone. The handset runs on Android OS of v5.1 Lollipop. Unfortunately the company website is thrifty in releasing more specifics of the new Xperia Z5 Premium Pink. The Xperia Z5 series of Sony was liked by people for their camera. Xperia Z5 Premium Pink also holds a camera with 23MP. This snapper is enhanced with unique feature called Fast Hybrid Autofocus. This snapper lens can be used to capture high resolution images as well as videos of 4K quality. Being silent on the capacity of battery, the officials declared that the battery of Xperia Z5 Premium Pink can hold the smartphone live for upto 2 days. 2 days battery support is quite incredible for a smartphone these days. Atleast we can be relieved of buying and carrying a powerbank. Also with the help of new Extended Mode, users can enhance the stand-by power of the smartphone. Xperia Z5 Premium Pink is having a Waterproof and Dust Tight IP rating. This means that the new Xperia Z5 Premium Pink is water resistant as well as dust resistant. It was rumored that Xperia Z5 Premium Pink will be available initially at Asian Markets. But no official declaration came from the part of company officials regarding its release. Anyway the launch of new Xperia Z5 Premium Pink was made through its official Twitter. Also no information regarding the price tag of new device is available till date.